Is mountain biking cheaper than it used to be? We came across an old issue of mbr from 1997 and were fascinated to see what you got for money twenty years ago. How on earth did we ever afford it? Please note that we say “cheaper than it used to be” and not “cheap”. What, if anything, this investigative comparison shows is that mountain biking has never been a cheap pastime. In fact, it used to rather conspicuously expensive. Mountain bikes were all very glam and costly and desirable when they came out. They were a status symbol. A target of lust for everyone whether they actually wanted to riding off-road or just do skids in the precinct. Nowadays you can actually get cheap mountain bikes. Not only that, you can get cheap mountain bikes that are actually good. But anyway, let’s have a look at some of the bikes and products from 1997 and see how they compare to stuff from 2017. We’ll not compare the function of the two eras; the 2017 bikes and bits are so much better that it’s almost unbelievable really. So we’re not going to do a 100% spec-for-spec, like-for-like comparison. Things have changed too much. But what we will try to do is compare similar level of kit and bikes from 1997 to those in 2017. We’ll be comparing 1997 entry-level with 2017 entry-level, 1997 high-end with 2017 high-end and so on. First, a quick word on inflation. How much was a pound worth in 1997 compared to 2017? According to the Office for National Statistics prices in 2017 should be 71.5% higher compared to prices in 1997. Something that cost £100 in 1997 should cost £171.47 today. With this in mind we’ve listed two ‘prices’ for the 2017 comparison products. One that is what inflation says the price should be in 2017 and one that states what the price actually is in 2017. The Judy XL was actually pitched as being a more affordable version of earlier bonkersly expensive suspension forks from RockShox aimed at pseudo-DH riders and aggressive trail riders (this was before the era of ‘All Mountain’ and so on). 100mm of sweet elastomer travel and a QR axle. They do still look fantastic though. Did we really used to ride around in Lycra shorts and massive moto gloves like these? Well, some of us did. It was either big burly gloves like these or roadie-style fingerless mitts. Which was worse? Hard to say really. Some things age gracefully. This F2000 SL from Cannondale still looks fabulous. Clean lines, chunky tubes, elegant Headshok, snazzy Coda cranks and an overall stance that doesn’t appear to be that daft. Made from top end aluminium and finished with Shimano XT and Mavic Crossmax wheels. It’s tricky to find a true comparison in 2017 Cannondale without going to a carbon frame, so we’ve gone with a carbon F-Si as it’s the best ‘updated’ version of this racey ‘Dale. Carbon wheels that promise the world and cost the earth. Some things never change. Except the ditching of mega-spoke wheel designs like Spinergy. Can you imagine what it was like rumbling your way down the trails with these things under you, complete with several branches and squirrels stuck in there no doubt. Kinda rad in a way. Some of you whipper snappers may not even know of the brand Sachs. Basically Sachs morphed into SRAM. This Plasma rear mech was actually something of mild game changer. Purely by its cunning repositioning of the cable entry point that vastly reduced cable bind or drag, the Plasma was an instant success and many UK riders made the switch from Shimano. Those of us sad enough to know such things can reveal that MULE is actually an acronym, that’s why it’s all in upper case. It stands for Medium to Ultra Long Endeavours. Why do I remember this? Probably because my Camelbak Mule cost me nearly seventy quid! That was probably a week’s wage right there. Beast by name, Beast by nature. The Proflex beast was a wild and aggressive animal of a mountain bike. Four inches of travel at either end and the back end rocking a coil no less (maybe the front Girvin Pipeline Chubby fork was coil too?). The hydraulic brakes, although rim brakes and not discs, were a sign of things to come. The majestic GT Zaskar. Part of the mountain bike firmament since its debut sometime in the mid nineties (1995?) and still a righteously good ride in 2017. The main thing that strikes us now is memories of the arrival of V-brakes finally making GT’s triple triangle frame design less of daft bit of form over function design. 2017 alloy Zaskars of a similar spec to this one actually only cost about £1,000 but we thought we’d be kind on the ghosts of 1997 and compare it to a modern carbon Zaskar price-wise. Even then it still loses. So, is mountain biking cheaper than it used to be? It’s a tale of two spectrums essentially. Entry level and mid-level stuff is significantly cheaper in 2017 compared to the same level of kit and bikes in 1997. The general trail riding mountain biker genuinely has never had it so good, and cheap. But high-end stuff has seemingly become even more expensive than it used to be back in the day. By the nature of media, as well as readers, the focus will always be on the high-end stuff when it comes to reading about mountain bikes. The latest innovations are the most interesting. Value is never fascinating until you’re in the bike shop or browsing online. This over-concentration on high-end bikes and bits can often give modern mountain biking an undeserved reputation for being elite and prohibitively expensive. Sure if you want the best that 2017 has to offer then you are going to have to splash out (or borrow, or finance) frankly ridiculous amount of money. Much more than the equivalent outlay 20 years ago. The thing is though, you don’t need to get the best to end up with a product that works these days. Cheap stuff works great. Cheap stuff in 1997 often just simply didn’t work. You were basically forced to spend loads of money in order to be able ride off-road and enjoy it, you know, without dying and stuff. There’s now no need to bankrupt yourself to go biking. We know that this small one-off sampling from an old issue of mbr is not exactly an exhaustive comparative piece. 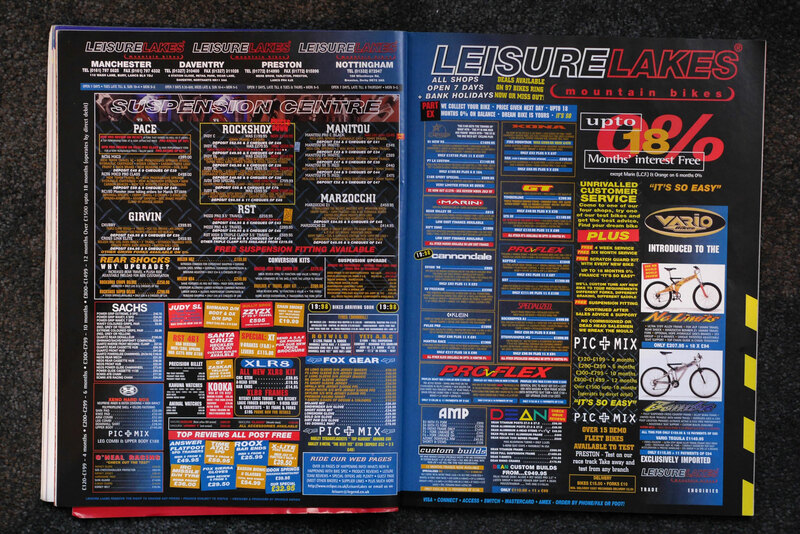 So above we’ve taken a pic of a double page advert from Leisure Lakes so you can have a pore over all the prices yourself (click for the high res readable version).